A marijuana plant needs energy, just like humans and animals and plants absorb energy from light through their leaves using chlorophyll in a process called photosynthesis. Include carbon dioxide (CO2) from the air and water (H2O) from the soil, and that light is converted into energy for the plant. Understanding this process can help you grow stronger plants. So, this guide will explain the three steps that a plant takes to go from light to growth. First, let’s start with photosynthesis. Photosynthesis is the process of turning light into energy and it is an essential process for all plants. Thankfully, all plants can naturally do this, and the marijuana plant has an ample amount of chlorophyll in its leaves to absorb light. Since this process will happen on its own in any plant, there isn’t much to stand in the way of it– that is unless you remove the light source or reduce the amount of chlorophyll. That is why your choice of pruning methods and light sources can have a significant effect on the health of your plant. Additionally, plants don’t use just any type of light – a certain type of light is required for growth. Specifically, the strength and color of the light will impact how well photosynthesis does. 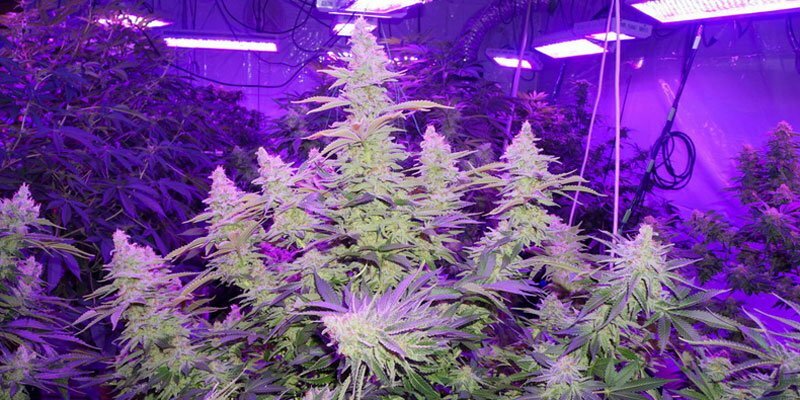 Your marijuana plants need a certain type of light depending on what is specifically going on. In nature, the sunlight naturally changes with the seasons, but if you are growing indoors, different types of light will need to represent the changing seasons. For example, during spring and summer, a bluer spectrum of light fills the sky due to the sun’s more direct path. This blue light tells plants to grow big leaves and short stems. This corresponds with the vegetative stage of marijuana growth. In the fall, however, the sun takes a lower position in the sky, causing the light to have more of a red spectrum. This tells the plant that summer is almost over and that it must prepare for winter. For a cannabis plant, that means flowering and pollinating, so it grows taller and creates space between its leaves. For a grower, yellow, orange and red lights mean the formation of buds. There’s also a green light that plants can absorb energy from, although not as efficiently as blue or red lights. Green light is useful for increasing the overall photosynthesis process. It is often absorbed by leaves that are near the bottom of the plant, since the upper leaves tend to absorb all the available red and blue light. Learn more about marijuana grow lights in this article. The photosynthesis process also needs carbon dioxide (CO2) and water (H20). In nature, these two chemicals are provided by the atmosphere and the soil. In an indoor environment, fresh air and the appropriate growing mediums can ensure these molecules are present. The carbohydrates created during photosynthesis will nourish the plant immediately as well as throughout its life. In addition to fueling the growth of the plant (by feeding young foliage and buds), these sugars also mix together to create cellulose – which is 80% of a plant’s structure. Don’t want to read, watch the video. As light is absorbed by the plant, it gathers inside the chemical compound of nicotinamide-adenine-dinucleotide-phosphate (NADPH2) and adenosine-triphosphate (ATP). The first chemical helps synthesize carbohydrates, while ATP has a direct role in creating them. They combine with CO2 and H2O to form carbohydrates. This chemical reaction can go in both directions. During the day, light, CO2 and H20 create sugars and oxygen. 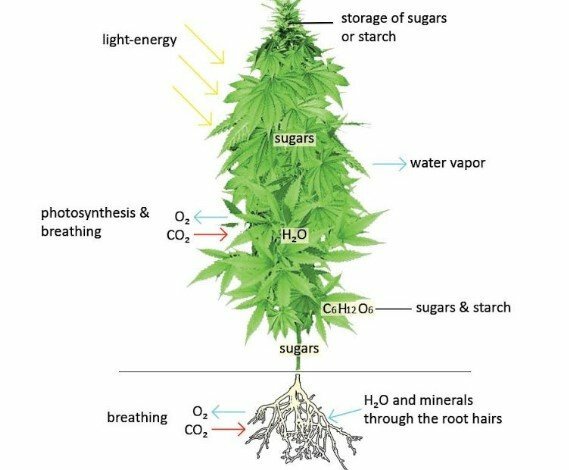 The plant then uses that sugar and oxygen to produce more sugars and releases any excess oxygen created through carbon dioxide assimilation. Since CO2 is used to create carbohydrates, it should be no surprise that increasing the amount of carbon dioxide can lead to better plant growth. Although you can find the CO2 that you’ll need in the natural air, there’s nothing wrong with adding to the environment. When combined with ample light, you are likely to produce healthier plants because the extra CO2 will be used to create more carbohydrates. Water, on the other hand, is different. Yes, your plants also need water to create sugars and provide oxygen, but more water doesn’t equate to more sugar production. If you add too much water you could drown the roots, and literally suffocate them of necessary oxygen. In a hydroponic setup, growers use hydro grow medium or an air stone to ensure the roots receive enough oxygen. For high-quality marijuana, your plants need to make a lot of sugars. Full- grown leaves produce these sugars, providing energy for the buds and young leaves to grow. In general, it’s a good idea to leave all leaves on your plant and let the plant discard those that it no longer needs. However, it is okay to trim young leaves and young side shoots as it can lead to a better distribution of sugars (=higher yield), but only do this if your plant retains its larger fully-grown fan leaves. You need those leaves, because sugar is an essential building block for your plants. In fact, your yield mostly depends on the amount of sugars in those large fan leaves combined with how well those sugar can travel to the buds. Perhaps 2/3 of the sugar produced in these leaves will end up in the buds, so it is important to protect these areas during the marijuana plant’s life. This number is set by nature, but there is a little room for growers to increase it. Since sugar production occurs in light, some growers may wonder why it is so important to have a dark period. The main reason is that protein production occurs at night. During the day, the process of photosynthesis uses chlorophyll to convert light energy into usable energy. When the light is not present, water continues to provide an unlimited supply of nutrition for the plant to survive off. In darkness, during a period called respiration, the plant produces proteins, and processes left over oxygen from photosynthesis. That oxygen is then released through the leaves as carbon dioxide and water vapor in a process called “plant breathing”. Another reason your plants must have a dark period is because if they don’t, they may take in too much water. When there is a lot of light, plants need more water. When plants take in more water, they also take in more nutrients, simply because the process of taking in water from the roots, also pulls nutrients with it. Unfortunately, the plant doesn’t know how to separate water from nutrients, and a thirsty plant might accidently overdo it on nutrients. This is the dreaded nutrient burn that growers fear. Plants need the dark period to basically cool down and self-regulate before they resume their sugar-making practices in the morning. With sugar being such a precious commodity inside of a plant, it should be no surprise that there is a lot of competition for it. Nearly every part of the plant wants that sugar, and some parts will work harder to get it. Sugar is distributed throughout a plant based on a principle called sink strength. Like animals, plants have organs, and these organs function like individual sinks that sugars flow toward. However, these sinks are not created with equal suction. Organs with a larger sink strength will always receive more sugar than those with a lower strength. Lucky for growers, a main bud site will typically have a sink strength that is 3 times as strong as young foliage. That means three times as much sugar for a nearly mature bud regardless of how much sugar is being created. Nature has ensured that the cannabis plant is a well-oiled machine when it comes to the distribution of its sugars. There is no waste; mature leaves always create more sugar than they need, and new foliage always needs a lot of sugar. In a healthy plant, the process of photosynthesis produces plenty of sugar to support the plant and always puts its priority into supplying the buds first. Even though nature prefers the formation of buds over leaves, some growers like to boost the process just a bit. Although these sugars are guaranteed to go to the right place, you can still increase the overall concentration of available sugar by trimming young leaves. There are a few ways to ensure your precious sugars go exactly where you want them to. While you shouldn’t remove your fan leaves, it is perfectly fine to trim young foliage leaves. They are simply using energy, and if they aren’t around, that energy will go to the buds. Before you start trimming however, you’ll want to check and make sure that you have enough foliage and fan leaves to keep the plant thriving. In other words, do not trim until your plant is very busy and can spare a few leaves. It should be dense enough for no light to pass through. It’s a good idea to stay away from the top fan leaves. They catch the most light, have the most chloroplasts and, therefore, can produce the most sugar. Bottom foliage leaves, on the other hand, rarely get any light and aren’t able to make that much sugar, so they won’t be missed. If a fan leaf is not receiving much light, though, and it is using up more energy than it is producing, it is okay to trim. Many times, a plant will recognize when this is happening and force the leaf to fall off, but if you can tell that it is about to happen, it is okay to help the plant out a little. Mother nature provides us with everything we need to grow amazing marijuana, but when you take it indoors, the task becomes yours. Understanding how light works can not only make you a savvy grower, but it can also help you grow the best weed possible.